I am not putting this in the Europe section due to the complex, multi-continent nature of this discussion. As Holy Roman Emperor, Charles V could be said to have represented the Habsburgs at their zenith, certainly in terms of the territories they held. He was King of Spain (specifically of Castile, Aragon, Valencia, Navarra and Count of Barcelona), King of Germany, King of Italy (north of Rome), Naples, Sicily and Sardinia, and held the titles of the Low Countries. It was under Charles V that the concept of a Universal Monarchy was articulated by numerous ideologues in this period, which meant the first half of the 16th Century - incidentally, the same era the Reformation began and convulsed Europe. What can be said was that perhaps Charles V was one of the last Holy Roman Emperors to take such an idea seriously, and to have made his presence felt and an impact on all the territories under his sovereignty or suzereinty. By no means this was a centralising, absolutist vision for the states under his rule had their own self-government and administrative arrangements. The vision of such was of the Emperor not being the undisputed highest-ranking monarch in Europe, but indeed the known world. There was a certain inclusiveness about this vision - elite Native American guests arrived at Charles' court in Spain, and there were wars fought in North Africa against the ever-expanding Ottoman Empire which meant restoring the Hafsid caliphate in Tunisia, and having some Berber support in the failed Algiers expedition of 1541. His main rival was Francis I of France, who would ally with the Ottoman Empire. Portugal, like Spain, was building its own colonial empire and global commercial interests. During this time, Portugal also allied with Ethiopia in the war with the Adal Sultanate. England was also on good terms with Charles V at the start. The idea of a Universal Monarchy under Charles V left endless possibilities. What if his vision had been realised and extended? Frederick II, Holy Roman Emperor, King of Germany, Italy and Sicily, was another example of a far-reaching vision. His vision harked back to Ancient Rome, yet his reforms (e.g. Liber Augustalis) created a proto-modern state setup in southern Italy. This was also reflected in the gold coin Augustale, with its classical portrait of the Emperor. 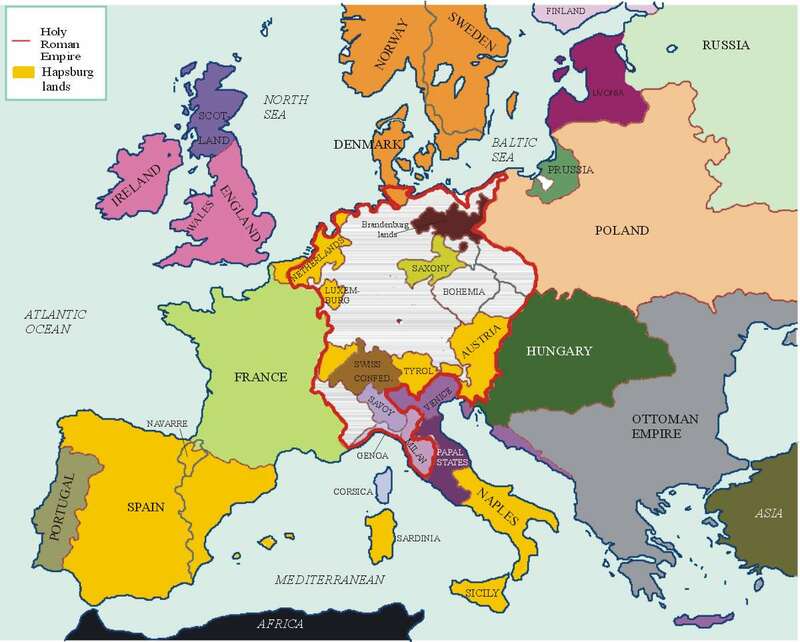 In any case, the Holy Roman Empire had become increasingly a nominal entity as its constituent states came to exercise sovereignty. The proclamation of Prussia as a kingdom reflected that, a move that was later to be aped by Bavaria Württemberg and Hanover. Outside Europe, analogous concepts of universal monarchies also exist. The Islamic Caliphate has been one such, but the later Abbasids hardly exercised power in that capacity, and the Ottoman Empire never made much use of the title they appropriated for themselves. Shahanshah (King of Kings) in Persia, Negusa Nagast in Ethiopia, and similar titles in other cultures. Among African kingdoms there was/is a tradition of paramountcy that became largely nominal, as in the case of the Yoruba Oyo kingdom in Nigeria as other Yoruba states became self-ruling. Oyo is often described as being an empire in Western sources, as are a number of historical African entities. India presents another issue altogether. As this article demonstrates, what set Indian civilisation apart from others was a certain weakness in statecraft - none of the dynasties that ruled the Subcontinent or parts of it were ever able to integrate its constituent parts and establish permanence. When new imperial aspirants emerged, they usually began as vassals of decaying empires. The emperors of China were another type of "universal monarchy", for China was the Middle Kingdom as the centre of East Asian civilisation. It may well be that the British monarchy through the Commonwealth represents a form of Universal Monarchy for the modern age. Very interesting post David. However, I think religion would always be a barrier to a global monarch. Charles V was a very pragmatic man, but his Catholicism was always a problem for the Protestant areas of Europe. It would have been insurmountable for Orthodox Christian regions, and even more so for non-Christian areas of the Middle East and Asia (particularly Muslim states and countries with an Imperial History older than Rome such as Persia, China etc.) But the idea is a very interesting one as far as "what ifs". Yes, certainly as Russia would itself be elevated into an empire, while Persia, China, Japan and India also had rulers with comparable status. The Universal Monarchy was more akin in a sense to today's Commonwealth where Queen Elizabeth II is head of state of 16 sovereign nations and head of the Commonwealth. Hence I made the argument the Commonwealth is the closest thing and maybe even a successor of sorts. Certainly the desire to bring Christendom closer together was there - after all Aragon and some Italians showed interest in contact with Ethiopia during the 15th Century, but it would be Portugal that would ally itself with Ethiopia in the next century. While the Kingdom of Kongo would also embrace Catholicism, a rare case of a native African monarchy outside of Ethiopia ever doing so.